Upload your photos/observations of native bees here! We have 28 species of native bees in New Zealand. Of those 28, 27 are endemic – meaning they occur only in NZ and 1 is indigenous – meaning it also occurs in Australia but arrived here unaided by humans (Hart 2007). They largely fall into three families – Leioproctus, Lasioglossum, and Hylaeus. Studying native bees can be difficult as there are few ways to easily monitor them. As a result, there is much to learn about their populations, diversity and distribution throughout New Zealand (Hart, January 2016). Natives do not have hives or produce honey like honeybees. They live in nests in the ground, under bare, undisturbed soils. Females of the Leioproctus family (the largest family of the three) dig 20-30cm tunnels into the ground, into which they lay one egg, and feed the larvae with pollen and nectar foraged from surrounding flowers. Lasioglossum bees are similar, although several females might share a nest hole. The Hylaeus family nests in plant material – beetle holes, or hollow straws in dead flax stems (Macdonald 2018). Native bees are not big travellers and so need flowers close by to collect pollen to feed their larvae. They play an especially important role in many of our ecosystems because they are among the most critical and effective pollinators of native plants, including mānuka, kānuka and pohutukawa. Each female lays three to 10 eggs before dying. Females from these eggs go on to build their own nests. They forage on natives such as pohutukawa, ti tree and native mistletoe but have also adapted to introduced flowers including kiwifruit and ragwort. For most species foraging range is limited (less than 100 m). 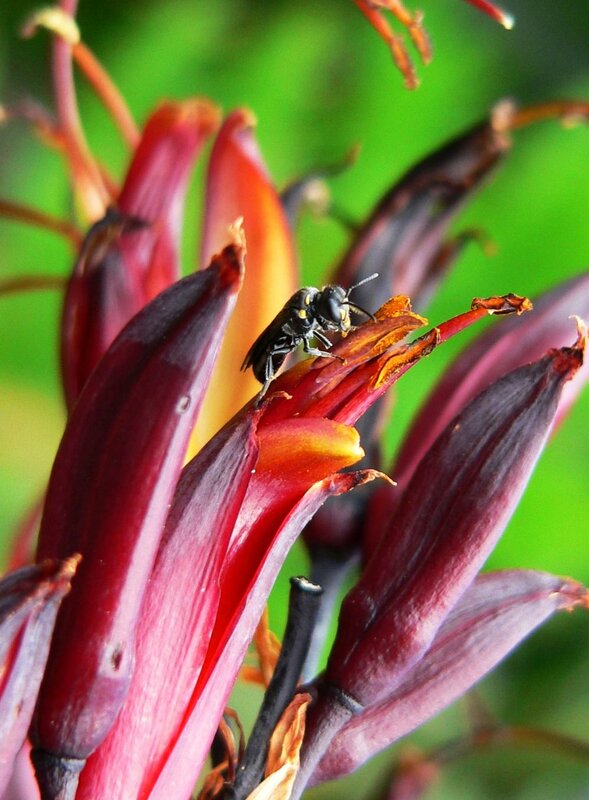 In comparison to New Zealand, Australia has over 1,500 native bees species. 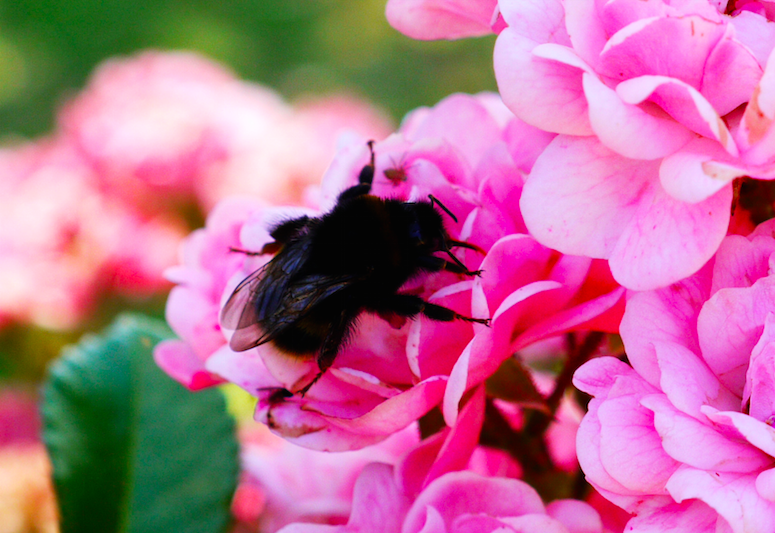 This fantastic article by Nikki Macdonald talks about the threats our native bees face, including introduced insects and habitat loss. There are concerns that our current glut of honey bees, spawned by ever rising demand for Manuka honey, is threatening our natives due to competition over floral resources. Honey bees have a competitive advantage over native bees as they can forage for longer and broadcast food locations to others in the hive. Ngaire Hart measured population decline of between 27 and 70 per cent at three locations, between 2010 and 2013 and suggests four possible reasons - natural cycles; loss of habitat; environmental pollutants such as herbicides; and increasing competition with exotic bees. Auckland University phD candidate Jamie Stavert discovered that NZ’s native bees don’t fare well with intensive farming practises. One species was completely wiped out as land use intensified. In contrast, exotic pollinators, including flies that breed in cow effluent pits, thrived and increased in numbers with intensification - by 150 percent. Only 2 of 13 native pollinator species increased. He says "By converting natural habitat into intensive agriculture, we're really changing the architecture of pollinator communities drastically and we still don't know what that means, both for the pollination of crops and native plants." One may think that having more honey bees around can make up for less natives, however it is not so straightforward. Honeybees often prefer introduced plants, so can spread weeds, and can take nectar from plants such as kakabeak, without pollinating them. Hart, N. (2007). Industrious Native Bees: A Case Study in Whangarei. Masters Thesis. Auckland University of Technology. Retrieved from (link). Hart, N. (2016). Monitoring New Zealand's native bees: a collaborative approach using image analysis. Thesis. Retrieved from (link). Kokeny, A. (2016). Native Bees…What’s the buzz? Auckland Ecology. Blog. Retrieved from (link). Macdonald, N. (2018). Native bees - small, solitary and under threat. Stuff. Article. Retrieved from (link). Piper, D. (2013). Our bees are dying. Stuff. Article. Retrieved from (link).